What file formats do i need to use? m4a files don't show in the browser, though they show on the list when the player is attached to my laptop.Do i have to convert them to wav? You'd better convert m4a to mp3 for mp3 format is one of the most popular audio formats. As for how to convert m4a to mp3, just follow below tutorial. To convert M4A to MP3 without iTunes but via Windows Media player is also a good method. 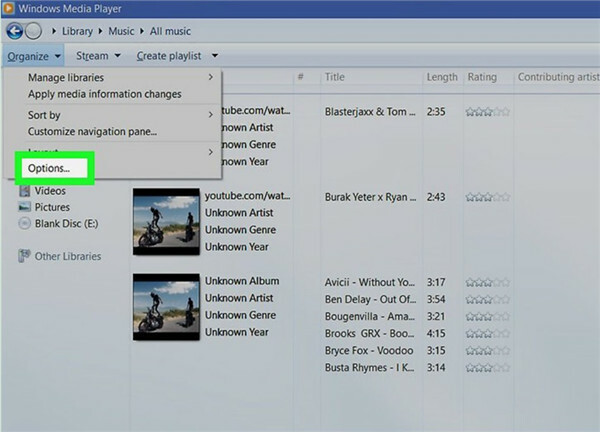 Windows Media player can play various kinds of media files, like WMV, WMA and MKV and MP3. This player is also useful when it comes to converting M4A to MP3. You can read through this part to see how to make it. 1. Run Windows Media player on your PC and then add the M4A files to this program via dragging and dropping directly. Thus, the files will be shown in the library of this software. 2. Hit on the "Organize" button at the top left of the interface and then choose "Options" tab to click on. 3. 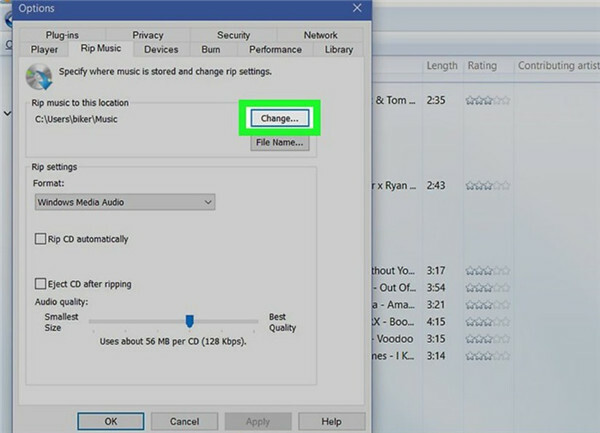 On the panel that shows up, you need to hit on "Rip Music" and then drag down to hit on the "Change" button to choose a proper folder for the converted MP3 files. 4. Move to the "Format" area and then click on the box under it to choose "MP3" as the target format via scrolling down. You are also able to set the bit rate for the output MP3 audio files. Click on "OK" button to confirm your settings. As you can see, you can get the converting task done with this solution with high efficiency. Have a try and you will know how simple this method is. Hi ! M4A is a format developed by Apple, that is to say it can only play on Apple devices and cannot be compatible with your device running on Windows or Android system. Advice you to convert M4A to MP3 or WAV format. Both are available for your laptop. Here is an article to teach you how to convert M4A to MP3 files. MP3 players can only play music files in mp3 file format. You can download mp3 music files from the Internet to your computer and then copy them to your MP3 player using the USB cable. For your CD collection, you need to convert your CDs to mp3 music files onto your computer or download them from the Internet and then copy them to your MP3 player after you have connected the USB cable to the MP3 player and the computer. You can do this using Windows Media player and Rip the CDs - Media Player will create a MP3 music file for each music track. I use this m4a to mp3 converter for the same purpose, it does all the work in a blink, try it, I am sure you will like it. And, by the way, it's free! You will need to ensure that you have 'linked' your mp3 player to your computer which would have required you to use an install disc so that your computer would recognise the new hardware. However some computer operating systems will automatically recognise what has been plugged into them via the USB port. You may also need to look at the files you are trying to download to your mp3 player. It might not be able to download them as your mp3 and the files that your are trying to download may not be the same format. Assuming you have connected your mp3 player to your computer correctly, open the folder marked 'My Computer' on your desktop. keep the browser window open and look to see where music is stored. There is normally a sample track like Bach.mp3 as a test track. If you see this file then leave that window open. Select one track at random, then click and hold with your mouse and drag it to the open music folder on your mp3 player (as described earlier). Then drop your music file there by releasing your hold on your mouse. One of two things will happen. You will either see the file copying on to the mp3's music folder or a warning may come up and tell you that this file is not recognised to play on your device. If your file that you want to have on your mp3 player is not an mp3 file, then don't worry, these can be changed on the internet to an mp3 file so it will play on your mp3 player. Look for Zamzar or in your net web browser put in the search box 'Free file conversion' and that will bring you up lists of sites that will convert your files to the required format you will need. I cannot be any more specific as I would need more information from you in order to help you more fully but hopefully the above will solve your problem, if not get in touch. This mp3 player is only compatible with mp3 files. If you can play the songs with your media player, chances are that you have the wrong file format for your player. WMA and m4A file formats are not compatible. Remove the incompatible files from your mp3 player. Import the mp3 files into your media player, then transfer them to your MP3 player. Eclipse mp3 player says "no file"
I had the same problem. I think most files that itunes uses are in a .m4a format. The eclipse mp3 player will need all the music files in an .mp3 format. The eclipse actually has a "software" folder that includes the "replay converter" that will convert these files for you - or you can download any number of freeware that will convert the files as well. Once I converted those files, my eclipse played everything. Prior to that - even though I had synced everything with my Windows Media player, I was getting the "No Files" message. Good Luck! The other mp3 player can't support itunes file except iPod.so if you want to play itunes music in all MP3 and Digital Media Players,you need a special program to help strip off the protection and convert the itunes m4p, m4b, m4a music to mp3. i always use wondershare music converter. my friend introduced it to me. it can convert the songs from iTunes at very high speed. What does unknown format mean? Why can't i play music? what this means is that you are trying to play an audio file on your mp3 player that is not supported by the player and thus it will not play. in order to make the audio file in question play, you will need to convert it into a readable format that is listed by the player it's self. to do this, find out what type of audio file it is (this can be determined be the file extention [.mp3, .mp4, .wav, .m4a, .flac] assuming your computer is set to allow you to see it. though most operating systems will display the file type in the info bar.) then search for "[insert format here] to mp3 converter" and purchase the software required. most of this software is relatively cheep and works on more than one file type. Sony Ps-lx430 phonograph turntable. Left channel is fine, might also contain the right. Right channel is a very quiet ghost of the left. I replaced the needle, no change. Ideas to get stereo again? Have a manual for Polaroid 4gb Mp3 Player pmp241tm-4 With Video Playback - Black Open Box Item?